Get directions and plan your visit here. 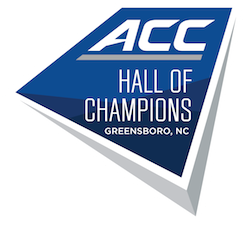 The Greensboro Coliseum recently hosted 2012 NCAA Men's Tournament 2nd and 3rd round games and during that weekend (March 16 & 18), the Hall of Champions was open for extended hours so visitors from around the country could check everything the Hall has to offer. Check out this piece by Nebraska TV station KMTV to see what fans of Creighton (one of the eight teams sent to Greensboro for the NCAA Tournament) thought of the ACC Hall of Champions.